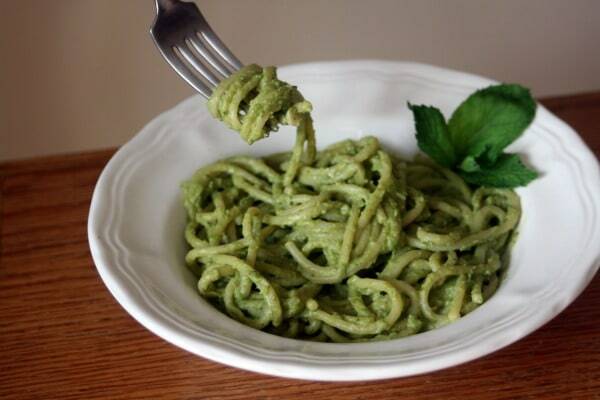 Pesto is this amazing little sauce. It's packed with flavor and incredibly versatile. Making it at home with ingredients found right in the backyard is also a delightful way to stretch the food budget. Preserve pesto this spring and summer for flavorful eating all year long. Traditionally, pesto is basil and pine nuts. But don't get stuck in that very limited frame of mind. Pesto can easily be made from a number of different ingredients for a more frugal sauce that flavors the most humble of meals. There are no safe and approved methods for canning pesto. However, it freezes beautifully. Once your pesto is made you can freeze it in ice cube trays. Once frozen, pop out of the trays and place cubes in labeled containers. Alternatively, freeze in small jars. Half pints or even the four ounce jars work well. I default to freezing in jars – a half pint is perfect for a 12″ pizza in our experience. One of the easiest ways to stretch the food budget and pack the pantry with preserved weeds. This is also a tasty way to use up weeds beyond just salads. Combine those homegrown chives with the ever prolific dandelion greens for a flavorful and nutritious pesto. Chickweed makes a bright but mildly flavored pesto perfect for pasta, rice, and more. Put the invasive garlic mustard to good use while also helping the rest of the garden flourish. Traditional pesto is, of course, mainly basil but it can be made from almost any garden herb or combination of herbs. 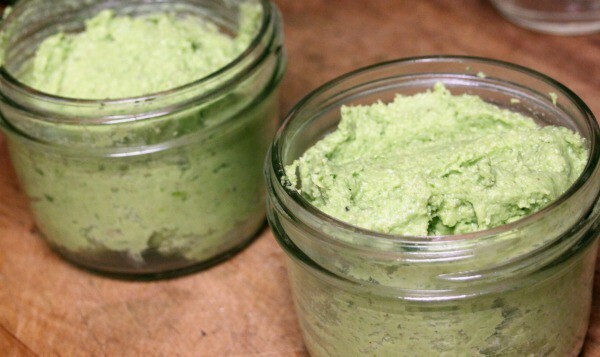 Make and freeze your basil pesto right in the canning jar with this easy method. If you're a cilantro fan, it too can be made into pesto for all kinds of delicious meals. Oregano can be quite productive in the garden. Don't let it go to waste – freeze it in pesto for later. 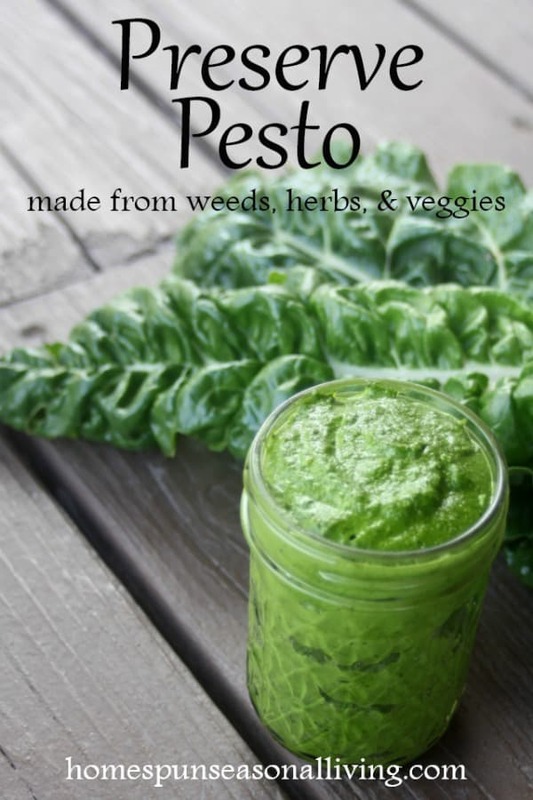 Even many vegetables make for delicious and easy pesto giving us another way to save and use them later in the year. 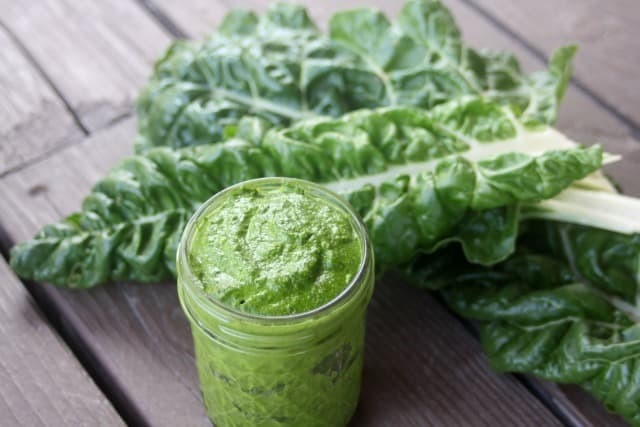 Greens, like chard, make for delicious and easy pesto. Most of us compost our radish greens but they too are edible and can be turned into tasty pesto. Even the ever productive, zucchini can be turned into pesto. To use preserved pesto, simply thaw and use as normal. Toss with pasta for a simple and flavorful meal. Mix into rice with and other veggies for a quick side dish. Spread onto sandwiches instead of mayonnaise or mustard. Use pesto instead of tomato sauce on homemade pizza. Remember to preserve pesto this year to keep your meals flavorful while also making full use of everything growing and available to you. It's quick, easy, and oh-so-rewarding.